Ella Khan (Jane Horrocks) & Auntie Annie (Sally Bankes) in East is East. Photo by Marc Brenner. 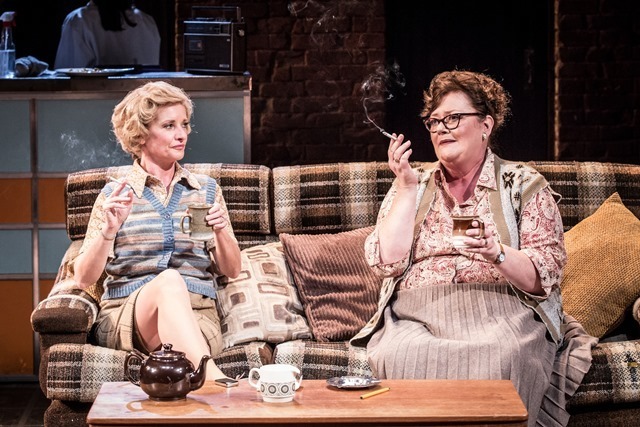 Perhaps it's because of its filmic origins, but East is East starring Jane Horrocks brings a grounding and everyday tenderness rarely found in the grand halls of the West End. Writer Ayub Khan Din (who also stars as despotic father George Khan) delivers a deft touch to the most painful and commonplace of domestic situations. Ultimately, he creates a torrent of laughs. The scene is 1970s Salford. Pakistani-English family the Khans are going through all the usual trials and tribulations, but with the added difficulty of fitting into a largely white environment (a very real problem 40 years ago). Not only this, but Ella (Horrocks) must tread the tightrope of pleasing her bullying husband George while fulfilling her children's wishes to be free and independent. Lovable characters populate the play, and we warm to each of them. Saleem "Picasso" Khan (Nathan Clarke), is the son studying foundation art, while all the time his father believes he's on an engineering course. His mother smuggles felt tip pens from the market — one of many brave concessions to support her kids' dreams against the wishes of Khan. Then there's Meenah (Taj Atwal) — positively brimming over with mischief and craftiness ( like when she sprinkles curry powder everywhere to mask the reek of bacon). The youngest, Sajit (Michael Karim) refuses to remove his manky anorak, wearing it as a sort of invisibility cloak, which still fails to save him from an eager auntie who, with one glance into his underpants, confirms he's a case for circumcision. Lightheartedness pervades, but Sam Yates' subtle production allows darkness to creep insidiously at the edges and unexpectedly emerge between joyous moments. Domestic violence rears its ugly head — the father taking it as his right to punch Ella and even his sons when they step out of line. What's so affecting is the apparent normality of the marital violence. As Khan Din and Horrocks begin to fight, they could almost be embracing. East is East is a strangely feel-good, modern classic about growing up in multiracial England. Tricky issues are tossed in, but this is not the weighty fare you often go to the theatre for. Instead, the play offers a brand of reality and the comedy of family life that makes for an altogether refreshing night at the theatre. East is East is on at the Trafalgar Studios until 3 January 2015. Tickets £13 - £52.